Guests will see the most beautiful sights of the Hungarian capital during the two hours City Tour. They will get overview of Budapest and take look at the most beautiful and imposing buildings of Budapest during the tour. They are going to visit both sides of the city - Buda, which is the hilly and Pest, which is the flat one. At Pest side guests are taken to Heroes' square, where they can see the statues of the most important kings and heroes of the Hungarian history. Along the nicest promenade of Budapest (Andrássy Boulevard) we reach the city centre and pass by St. Stephen Basilica. The largest and nicest building in Hungary - the Parliament - is situated on the river bank. After passing by it we cross the Margaret Bridge and this way we reach Buda. 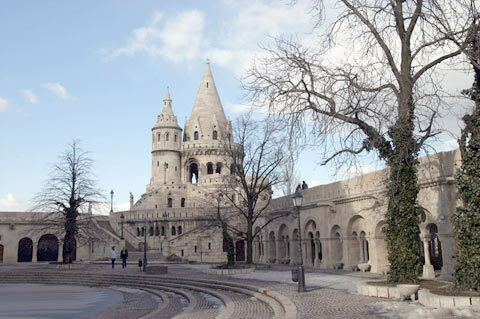 Here the guests will visit the Castle District - Matthias Church, Fishermen’s Bastion. We take our guests to a short walk and show them around the medieval Buda. Finally we take them to Gellért hill. From the panoramic terrace everyone will enjoy the wonderful view to the entire city. At top of the hill the Citadel is situated, a former military fortress, built during the Austro – Hungarian Monarchy. After the Budapest city tour we take our guests to Szentendre - to the Mediterranean artists' town. It’s situated about half an hour driving distance from the city centre. The guide will show the guests the little old 18th century houses, the wonderful main square with the holy trinity monument and lots of craftsmen's shops. There is the nice river promenade with cafes, restaurants, ice cafes along the Danube bank. For lunch guests are taken to a traditional restaurant. They will be served a three-course menu that includes typical Hungarian dishes. Part of the restaurant is the National Wine Museum where wine-tasting is possible. Guests can try different wines from the historical wine regions. After lunch in the town of artists’ they can visit either Margit Kovács Ceramic Museum or the Marzipan Museum. Free time and shopping in the local shops is also possible. Return to Budapest.